Well, this is a little weird. 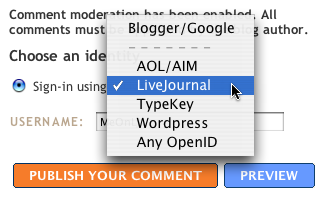 Instead of using a user name, I have to put in my blog name. But still, it's better than using one of my two unused blogger accounts. After using Wordpress, I really can't stand to use blogger any more. It's really kind on clever. After you type in your website address, OpenId checks that you're signed into your WordPress account, and reports back to Blogger that you're the owner of that website.